I don’t know if I have shared this with you before, but I am obsessed with eggs. I just love them. In fact, many of my favorite childhood memories have eggs in them. Like sitting next to my mom before she left for work, so many mornings, as she ate her usual scrambled eggs with ham, always cooked until tender, along with a piece of black toast with a thin spread of honey. Like when my dad taught me how to crack a soft boiled egg, using a coffee spoon in such a way as to impeccably remove the top, revealing the still runny yolk that seemed to be waiting for soft butter and a sprinkle of salt to be mixed in. Then, he rushed to dip a piece of toast in the hot yolk and gave me the first bite. Like the very first time my mom obliged my plea to let me cook and commissioned me to make the Sunday brunch scrambled eggs. She gave me the eggs. The bowl. The pan. The butter. The salt that she took from the spice cupboard and left it open. Temptation was too hard to resist, and I added more than a dash of every bottle in it. Bright red paprika, beautiful star anise, deep yellow cumin, fragrant crumbled cinnamon, and on and on… You know how those eggs turned out. Since then, I have tried to tame my enthusiasm when cooking. I find eggs to be one of the most fascinating ingredients. They are affordable. They are beautiful. They are accessible. They are versatile, too, and can be eaten for any meal of the day, any time of day, taken for a sweet or savory spin, taking center stage or as a crucial ingredient. To boot, they are, along with milk and seeds, amongst the most nutritious foods on earth. Oh, and if that wasn’t enough, they can be used for so many purposes aside from being eaten as eggs: they can act as a binding ingredient (think meatballs), as a thickener (such as in chocolate mousse), as a volume booster (like in a soufflé!) or as the medium that makes other ingredients shine (like in a frittata or omelet). It is no surprise then that I have a hard time starting my day without eggs. My most common quick breakfast is, like my mom, scrambled eggs with ham. Followed by Huevos a la Mexicana, sometimes straight and sometimes adding crunchy green beans, slightly sweet diced zucchini or thinly sliced woody mushrooms. I can’t resist huevos ahogados or drunken in one or another salsa, like salsa verde, martajada or in a chunky tomato and poblano rajas salsa. Enchiladas stuffed with one or another kind of scrambled eggs for a sumptuous brunch are king for when you have guests. Any form eggs can take for a morning concoction, such as breakfast crepes, tortas, sandwiches or tacos, I will eat them up. OK: getting to the point of this post. I love eggs so very much that the fact that there is something such as deviled eggs makes me beyond ecstatic. One of the best ways to honor the egg that can be eaten post breakfast and is so pretty, tasty and a classic finger food. If there are deviled eggs on a menu, you know I am ordering some. If there is a tray being passed around at a cocktail hour or party, you know who that crazy woman is trailing the deviled egg tray. Here is my version: I called them Twice Spiced, as they benefit from two of my favorite spicy Mexican condiments: Chipotles in adobo sauce and pickled jalapeños. You know you have nowhere else to go than to the kitchen to whip some up. Place the eggs in a saucepan and cover them with water by a couple inches. Bring to a boil over medium high heat. Let the water boil for a minute, turn off the heat, cover and let the eggs steep for 9 to 10 minutes. Remove the eggs from the water and let cool. Once they are cool enough to handle, peel and place on a chopping board. Using a sharp knife, slice each egg in half vertically. With a spoon, remove the yolks and place them in a food processor. Along with the yolks, add the mayonnaise, crema, mustard, chipotles in adobo sauce, pickling vinegar from pickled jalapeños, white vinegar, unsalted butter, scallion and sugar. Process until completely smooth and fluffy. Give it a full minute of your time. Place the egg yolk mixture in a pastry tube or use a plastic or piping bag. I like to use the star tip, but you can use a tip with whichever shape you like - you can also use a teaspoon. Add some of the minced bacon at the bottom of each white half. Pipe or spoon the egg yolk mixture on top. Garnish with the jalapeños and serve. this sounds good, I will have to try making it! I would use avocado’s instead of all the yolk,some yolk,to cut back on the cholesterol! Just a healthier option to use! Thanks for sharing Pati you have some real good recipes. Oh that will be yum, Mary! I love this concept. But I’d top it with a very thin slice ripe (bright red) fresh jalapeno. Ah, my garden is full of them in the moment. Mmmm so good too, Gary. Like you I am absolutely obsessed with eggs. I can’t get enough of them. This recipe sounds absolutely delicious. Can’t wait to try it. Thanks for sharing Pati! Buen provecho!! Me too! Hope you love the deviled eggs, Tom. Hope you are well…quick question: Can you make these the night before for a daytime barbeque and refrigerate them? I see recipes for deviled eggs that say “refrigerate for up to 8 hours” and wasn’t sure if you refrigerate them longer if anything would happen. Please let me know and thanks! You can make them up to 24 hours ahead of time…enjoy your BBQ, Jamie! Now that I made these for a BBQ, I am under strict orders to bring these to EVERY event I’m invited to! I love your show and your web site. I often do not have the exact ingredient your recipe suggests. I then wonder what might be a good substitute. What do you think about building a page with substitute ingredients and adding a link on your website/recipe to this new page? I have a Mexican pot luck dinner to go to and this recipe is going to be PERFECT! I enjoy your show so much. You are so passionate about your heritage and your cooking- it is so contagious! I look forward to sharing your Twice Spiced Deviled Eggs with my friends. This is such a great pot luck recipe. Have fun, and thank you for the kind words, Mary Beth! Wow! Just reading your article on Twice Spiced Deviled Eggs had me so intrigued. I definitely need to try your recipe, because like a Mexican women, I myself grew up eating huevos every morning. Deviled Eggs are my fav and as I just kept reading my mount just watered. I thank you for sharing your recipe and definitely will try it. I started following you one day I had a channeled on and your show came on and since then I’ve been hooked. Love your show and love how you involve your son. His so cute. Thank you for such a great inspiration. I’m so glad you found the show…and became hooked 😉 Enjoy the deviled eggs! Lovely! I know the article was primarily about the deviled eggs, and I’ll have to try the added crema and vinegar (I already use the other ingredients depending on my mood), but really, how have I lived this long and never heard of huevos ahogados?! My mom is a great cook; maybe she would have made them if I liked poached eggs. She taught me how to cook a lot of things, and how to figure out the rest. I can’t resist reading cookbooks to mentally taste recipes and when I cook, it’s rarely the same twice. Ever since I made him pancakes, graduating from simple cinnamon to other spices to lemon and blueberries, my son is learning now too. This week, among other things, I made chocolate from cocoa to dip strawberries and pineapple chunks, Cajun-style spicy jambalaya, and home-made chicken noodle soup with hand-rolled and sliced egg noodles. It’s been a great week. If I have no time at all, I steal time to bake bread when the stress of no time gets to me. Home made bread is my specialty; there are so many variations it’s like play time! I love your cooking! I’m so happy when I can watch your shows, and your whole family is adorable! There are plenty of chefs who seem to delight in making a lot of noise, but I absolutely love your style. All about great food, family, and fun. I bragged on Facebook today (The Cook’s Cook Community Forum) about your cooking and your trajectory- bachelor’s degree, master’s degree, culinary school, cooking shows, books! And then I found your blog, and episodes on Amazon! You are amazing, brilliant, charming! Thank you for tuning in Michael! It sounds like you have lots of fun in the kitchen too. I hope you and your son have many more fun kitchen adventures! So excited that you are on Netflix. I am catching so many recipes that I missed. I’m gonna cook a 100% Pati meal for my boyfriend for his birthday (which is also Valentine’s day). Happy Birthday to your boyfriend and Happy Valentine’s Day! I love watching your show. I just watched the one with your Don JuJu and it made me look you up and I found your wonderful recipes. I have a little cousin name Jewel and her Nickname is JuJu and always loved that name😊Enjoy Hoo I love your show! Keep cooking and sharing! Thanks for teaching me more about Mexican food which I love! Thank you for tuning in Desiree! Say hola to your Juju for me. I love eggs. I can’t wait to try these! I have made these eggs with chorizo and they are wonderful. I also added bleu cheese crumbles to the mix. Chorizo and bleu cheese go great together. You are so inspiring and amazing! My husband and I watch you everyday from Australia! Thank you so much Jennifer for your kind words and for tuning in with your husband all the way from Australia. I love your show…and what a great personality…will be trying the deviled eggs soon! My son-in-law will love these. Thank you! 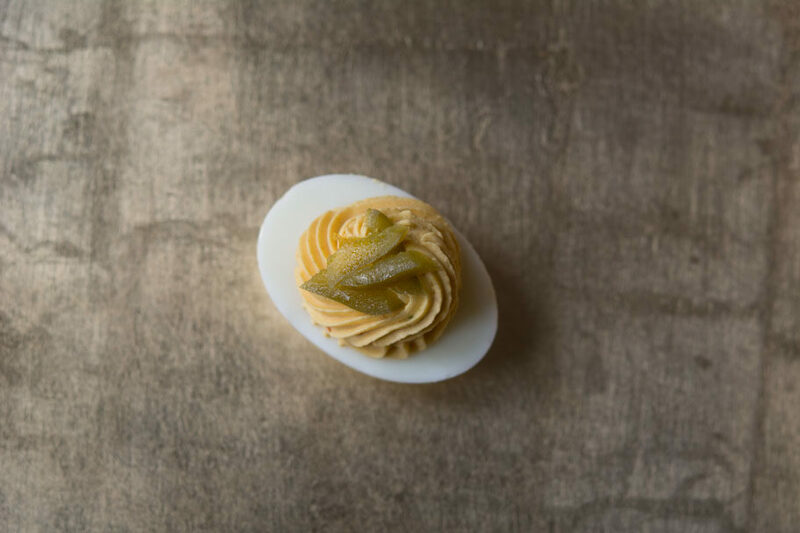 I have fallen in love with this recipe on deviled eggs. A big hit with my family. Thank you Pati. You are the best. Dear Pati, Love your recipes and will definitely try this one, though I may not be able to get all the Mexican ingredients in Adelaide, Australia. Funnily enough stuffed eggs were one of the very first recipes I did for a party, way back around 1970 when I was in my early twenties in New Zealand. The recipe wasn’t nearly as exciting as yours! When I post and entry on eggs to my “What We Ate” blog http://katywiddopsblog.blogspot.com.au/ I will be sure to mention your recipe. I hope you enjoy the eggs Katy! Bacon and chipotle. How can you go wrong? I made them for an afternoon snack. Delicious! Pero estoy de acuerdo con Mary Flanigan…chorizo seria fantastico! Jajaja yes chorizo would be great too. Nice, another magnificent training session that has me whirring fast to make these ASAP!!!. Much of these ingredients I use in my everyday cooking. Its nice to have another idea brought down from Pati to share with family. this will be another big hit with my everyone. Thank you Michael! I do hope it is another hit with your family. I’m with you girl! I could eat eggs every day and simply love deviled eggs. I will definitely give this one a try. Also thanks for the Huevos a la Mexicana recipe. I normally get this at a local taco shop but now I will be making my own. I’m so glad you like both egg recipes Norm. That’s a new twist on deviled eggs. Will try that for my daughter’s birthday on Friday. She/well all my kids & I love them and try to have them from home to school events. Happy birthday to your daughter Jeneva! Sound delicious , I love hard boiled eggs too . I always have 4 or 5 ready all the time ! But Iwill do the Devled Eggs ! Thank you Pati . Have you ever cooked with induction heat? I’m really tired of cleaning my gas unit with the heavy grates, scratched stainless tray and ugly knobs. It’s just 3 years old and looks ancient. I’m thinking of switching to a flat top, easy to clean and good looking unit for our new home. Hmmm I use a gas…but let me know how you like your new induction heat unit. Pati, like you my favorite food – huevos- any way shape or form. I love them for breakfast, lunch or dinner! Deviled eggs are my go to for all my brunch get togethers. These are so simple but with a twist of Latin Flavor that my next brunch will be a hit when I serve them. Muchisimas Gracias for bringing “our” wonderful Mexican Cuisine to the otherwise not so interesting American Cuisine. Ole! They are perfect for brunch! I love your uplifting personality and watching your show! Oh thank you so much Connie. Oh Old Bay is great. What a luscious recipe – bacon on the bottom?! My mind is racing – chorizo on the bottom – tuna tartare on the bottom – chopped shrimp on the bottom – a wonderful hidden surprise! The possibilities are endless. A nice change from the sprinkled top garnish or a mix in of ingredients. What great ideas! You’re right the possibilities are endless Mary. I will definitely try these twice spiced deviled eggs….sounds delicious! Thank you for sharing. Can’t wait to make the twice spiced Deviled Eggs. Sounds delicious! Please do let me know Jenny! I’ve used pickled ginger didn’t have enough kick! Can’t wait to try your recipe ,looks like it’ll have a good blend of spice and heat!😎 thank you Pati! I hope you enjoy it Craig. This sounds SO good. Will try..thanks for recipe! What is Mexican Crema and where do I get it? Oh, dear Pati, you are such a good writer! Star anise and cinnamon, right!!! I bet that’s the last time you added them to your eggs! It’s great fun reading about how you learned to love eggs from your parents. I have “met” your beautiful papa on your show. When I read your pieces, I hear your voice and it is beautiful; I am such a fan. Muchas gracias y much love! Oh thank you so much Keith for your super kind message! Sounds delicious!! Can’t wait to try some! I love Deviled eggs too. And I have eaten many different ways, spicy, not spicy, flavored, and with all kinds of additions. But there is nothing imn my mind that ever beats the plain, old fashionded basic deviled eggs. They just have their own flavor and are totally awesome. Thanks for sending this message to me, I love spicy deviled eggs. The recipe says to add chipotles in adobo sauce. The ingredient list only calls for the sauce from the chipotles. If you want spicier eggs, use the whole chile pod. If you use the sauce only, they will be milder.